Claiming The "Land By The Gallon"
"The Everglades used to flow from north to south in this big broad sheet of water. It was very shallow and very clean. And it kept the land wet all year long." North-to-south water flow and sawgrass marshes earned the Everglades the nickname “the river of grass.” But the Everglades are much wider and slower-moving than a true river. The greater Everglades ecosystem includes all of south and southwest Florida, extending east and west to both coasts. And a drop of water in the headwaters near Orlando may take a year to get to the ecosystem’s southern edge: Florida Bay, off the state’s tip. “There was always water, but never too much,” Grunwald says. That all changed when settlers lured by the promise of bountiful land for agriculture started moving south. They arrived to find they’d purchased “land by the gallon" (as described by a dismayed Iowan whom Grunwald quoted in The Swamp). The Everglades’ rich soil was covered by water several feet deep. Grunwald says it took time, but the new Floridians adapted, building canals, dikes and channels to manage the water for agriculture and development. “We squirted the water this way and that way so we could live without having water dumped on us in the rainy season, and we’d still have some water to drink in the dry season. The summer of 2016 vividly illustrated just how much our draining, channeling and containing has disrupted the natural order of the Everglades. The color of that illustration? Blue-green. Blue-green algae blooms -- thick as guacamole and smelling of sewage -- erupted on the Treasure and Gulf coasts. They nauseated residents, choked coastal fishing businesses and kept tourists off the beaches during the normally lucrative July 4th weekend. Florida Senate President Joe Negron, a Stuart resident, saw the profound economic impact on his community firsthand. That’s why he’s proposed a plan to address a main cause of the blooms: water releases from Lake Okeechobee. 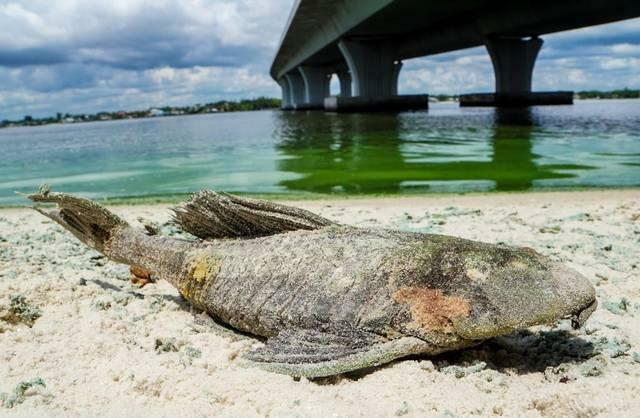 A dead catfish along the St. Lucie River. In the summer of 2016, blue-green algae blooms devastated the environment and businesses along parts of Florida's Treasure and Gulf coasts. The water in Lake Okeechobee has unnaturally high amounts of phosphorus. It got into the lake as fertilizer from fields and manure from farms. When Lake Okeechobee gets too high for the aging Herbert Hoover Dike at its southern rim, extra water is sent east and west. That water mixes with bacteria from old septic systems and more fertilizer, from lawns. All that makes algae blooms grow -- really fast. Negron’s proposal is to speed up planning and construction of a reservoir south of Lake Okeechobee. Because if you can send the water south, then it doesn’t have to go east and west. Julie Hill-Gabriel is a deputy director for Audubon Florida. She agrees with Negron that the excess water from Lake Okeechobee should be sent south. Which seems a little odd. Why would an environmentalist want contaminated water flowing into the Everglades? 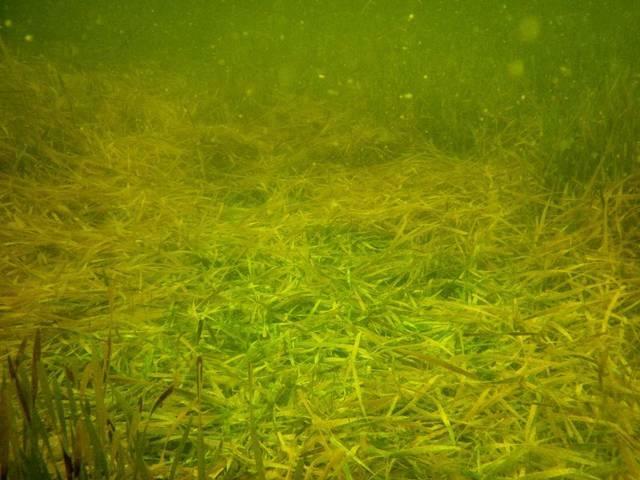 A lack of fresh water is killing seagrass in Florida Bay. The die-off elevates the bay's sulfide levels and threatens habitats of fish and other species. The answer lies in the dehydrated sawgrass and seagrass of the southern Everglades. And it gets at the problem underlying nearly all of the Everglades’ struggles: changes to water flow. Back before settlers decided to have farms around Lake Okeechobee, fresh water spilled gently over the lake’s southern rim. It nourished South Florida’s sawgrass, then seeped into Florida Bay, giving life to seagrass and the fish, manatees and crocodiles that lived in brackish coastal marshes. But then the Herbert Hoover Dike was built along Lake Okeechobee’s south edge. The goal was to protect farming communities south of the lake. Massive hurricanes in the 1920s sent water roaring over fields, destroying crops and drowning thousands of people. The dike stopped those surges, but also stopped water from following its natural path south. Instead, an incredibly complex system of pumps, levees and canals transports lake water into the southern Everglades. 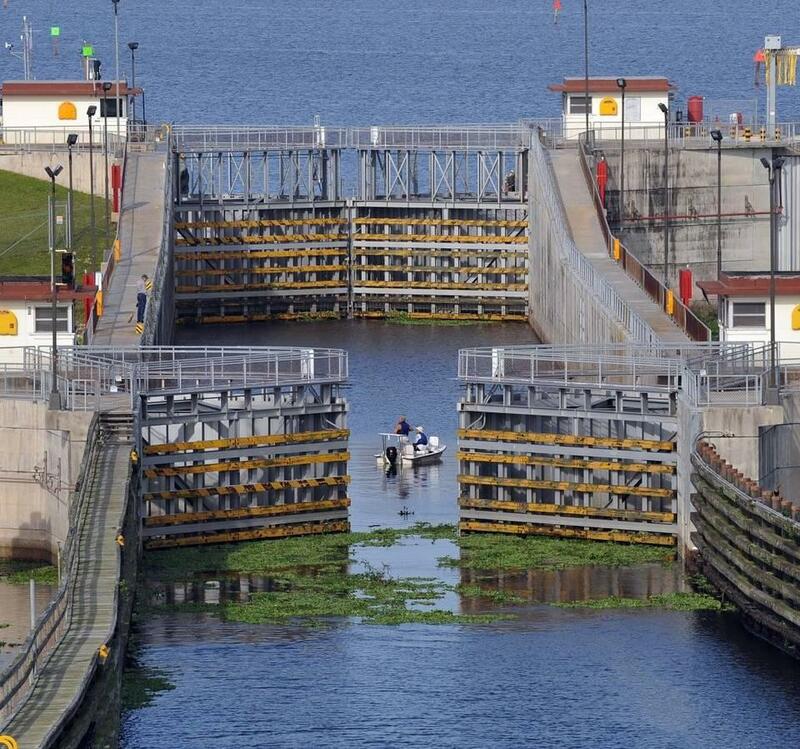 When Lake Okeechobee gets higher than federally-regulated levels (which vary by season), the U.S. Army Corps of Engineers releases excess water through locks like this one at Port Mayaca. Right now, too little fresh water is flowing south to Florida Bay. That’s causing areas of the sawgrass glades to dry up. And it’s killing off the bay’s seagrass, threatening the habitats of animals like manatees and crocodiles -- and the local tourism and fishing industries. Hill-Gabriel supports Negron’s reservoir plan because it would move more fresh water south, instead of discharging it east and west. And in addition to rehydrating the southern Everglades, south-flowing water would be cleaned in manmade treatment areas and natural sawgrass marshes. With the east-west discharges, “we’re wasting billions of gallons of water in two funnels,” Hill-Gabriel says. Environmentalists studying the Everglades’ many problems might have hard time picking which one is most worrisome. Blue-green algae, floods, droughts, fires and invasive species all compete for attention and research. But for Wayne Rassner, a volunteer guide in Everglades National Park and the board chair for the South Florida National Parks Trust, the answer is clear. 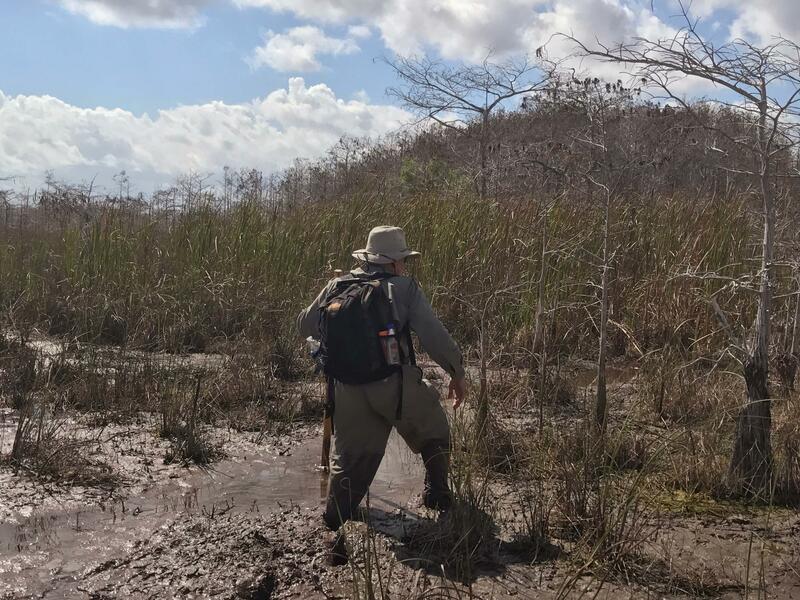 Wayne Rassner makes his way towards a cypress dome in Everglades National Park. Rassner is chair of the board of the South Florida National Parks Trust, which raises money for the national preserve and three national parks in South Florida. That’s why his message is easy to understand: A lack of fresh water in the Everglades is really bad news for the one in three of us who get drinking water from the aquifer underneath. “The importance of keeping water above it is twofold,” Rassner says. Pausing to rest on his walking stick, he explains that the Everglades’ marshy soil cleans water as it seeps into the aquifer. That’s it. If the Everglades gets too dry and seawater pushes its way into the Biscayne Aquifer, eight million of us will have to seek drinking water elsewhere. Not every Floridian cares about alligators or cypress trees, coastal tourism or fishing. But most of us care about having fresh water. That’s one reason there’s a multi-decade, multibillion dollar plan in place to try to restore what’s being lost. Karson Turner reaches into a grassy row of sugar cane. He grips a stalk, jointed like bamboo, and breaks it, revealing the sweetness inside. "This will go into the mill, which you can just about see if you take about 20 steps backward you can see the smokestacks. And those get grinded, that raw sucrose that gets pushed out becomes the basis of table sugar that you and I consume all the time," says Turner.